Snippets of Jack: "Welcome to the Caribbean, love." "Welcome to the Caribbean, love." After trying and failing to control his crew, Captain Jack Sparrow and Elizabeth Swann were marooned on an island. 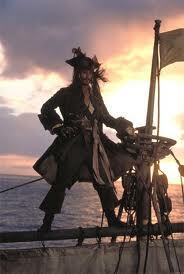 Previously Jack had been left on this same island after Barbossa lead a mutiny aboard the Black Pearl years many ago. This is how they (the crew) thought that he escaped; "How did Jack get off the island?" "Well, I'll tell ye. He waded out into the shallows, and he waited there three days and three nights, till all manner of sea creatures came acclimatin' to his presence. Then on the fourth morning, he roped himself a couple of sea turtles, lashed 'em together and made a raft!" "He roped a couple of sea turtles?" So how are Jack on Elizabeth going to get off you might ask. After seducing Jack in to a drunken sleep, Elizabeth commits a heinous act of complete villainy. She burns the rum. Oh that got Jack into quite a fit. "'Must have been terrible for you to be trapped here, Jack. Must have been terrible for you'—Well it bloody is now!" Eventually they are rescued But unfortunately for Jack; "There will be no living with her after this." But thats not the end of Jack and Elizabeth. She commits on more act of complete and total villainy.....She kills him...well all she did was kiss him really and then handcuff him to a poll sealing his fate forever, all right in front of her one true love Will Turner. But we know Jack, He doesn't stay dead for long.